Honda CB Shine SP price starts at Rs.63,539 (Ex-Showroom, Delhi) and the top end variant Honda CB Shine SP Disc CBS is priced at Rs. 68,333 (Ex-Showroom, Delhi). The 124.7cc air-cooled and carburetted single makes 10.3PS at 7500rpm and 10.3Nm at 5500rpm. The engine gets Honda Eco Technology and, coupled with a more efficient 5-speed gearbox and low rolling resistance tyres, should give good fuel efficiency. The addition of a 5-speed gearbox also improves top speed. Honda claims a top speed of 93kmph. Share your experiences with CB Shine SP? Q. Has this bike no vibration between 40 to 60kmpl. Q. How is this bike? Can I buy this? Yes,this bike is really good in terms of performance,looks, average etc. Q. मुझे लॉंग runing के लिए bike लेना है avg 100 kmh per day .तो कौनसी कम्प्म्णी कि bike लू? Q. Which bike is suitable for contineous ride of 500km? 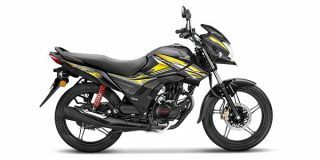 Confused about Honda CB Shine SP?